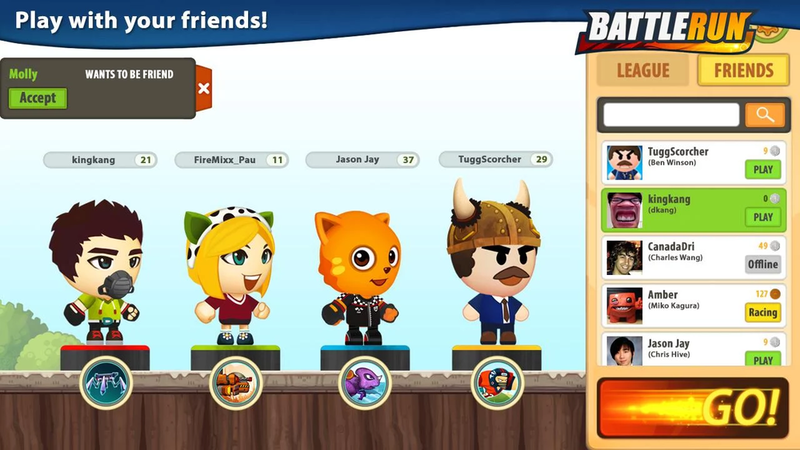 Battle Run is a multiplayer racing game. Players run, jump, use weapons, and ride pets to achieve victory. Welcome to Battle Run Season 2. The multiplayer running game that 3 million players love just got even better.Now you can choose 15 different pets to assist you! Battle Run is like Mario Kart on a 2D platform. You can outrun three other players in real time! If you can’t run fast enough, use a weapon to take down whomever is in front of you. Playing with your friends’ score is boring. Battling with them in real time is awesome. Missile, Chainsaw, axe, landmine, meteor, and many more weapons to hurt other players real bad. Customize your own set of cloth, hat, glass, mask, or even trailing effect. DRESS UP to look unique in the game! Get instant boost and extra shield with your PETs. All of them are different and unique. Climb up the ranking and be the best possible battle runner in the world!